Small live rock venues - are they going down the pan? Image caption Kaiser Chief's bass player Simon Rix said "musical history is regularly torn down". They were the launch pad for some of the country's most successful bands, but many renowned small rock music venues are struggling to stay open. Is this network of live music venues, known as the "toilet circuit", going down the pan? And what does it mean for rock and indie music? In Southampton, renowned music venue the Joiners is threatened by closure. Pub manager Patrick Muldowney has said they are struggling to fend off the bailiffs due to poor ticket sales. The pub opened in the 1960s and bands such as Radiohead, Primal Scream, Oasis and Coldplay have all played there. Stuart Powell, from local band The Slack Five, said the pub supports up-and-coming musicians and closure would have a huge impact on the city's music scene. "We started playing there a couple of years ago when we put the band together," Mr Powell said. "It's the place to play in Southampton and it's where anybody whose anybody plays. It will be shocking if it closes." Many of the country's smallest music venues are said to be part of the toilet circuit - a network of intimate venues given its name because some are so small bands have to change in the loos. Kaiser Chiefs bassist Simon Rix remembers how important such places were to his band when they were starting out, in particular the former Duchess of York in Leeds. "The Duchess of York was where I grew up", he said. "As soon as I looked old enough, I was in there watching bands. "I saw some great bands and some not great ones. I saw Supergrass, Ash, the Bluetones - I think I even saw Coldplay at the Duchess. "The Duchess is now Hugo Boss. What's the point in that? "Leeds lost its musical history with the Duchess. Musical history is regularly torn down - CBGB's is probably the most famous one. And for what?" The Forum in Tunbridge Wells, voted the best small music venue in Britain by the NME, runs solely on the passion of those involved. Jason Dormon founded the 250-capacity venue in 1992 with his friends. He said: "We're not going to close - there's no way - because we all work for nothing. "We've just done it for love over the past 20 years. I'm not saying that's the answer for small venues because obviously it can't always be done. "Some venues will have to close and it's a real shame. A lot of people are doing it for the love of it but the rents just keep going up." In October the government passed the Live Music Act meaning venues in England and Wales with a capacity of under 200 no longer need a licence for live music. The change in law was part of a government move to free businesses from red tape, which ministers said would give them more freedom to grow. UK Music, which represents the music industry, estimates that the Live Music Act could enable 13,000 more venues to start holding live music events. Mr Dorman said there may have been an increase in venues putting on live music, but it could have proved detrimental to the traditional small rock music venue. "Almost the opposite has happened and it has become over-saturated, because pubs can now show live music and people have become used to not having to pay to hear live music. "I've walked past a pub before and there's been a cover band on playing covers of a band we've got on." 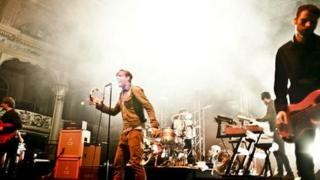 Paul Smith, lead singer of Maximo Park, said small venues are important to new bands who are building a fan base. He said: "Once they [bands] have a small following they can generate a great atmosphere in small venues, regardless of whether their audience grows or not. "Clearly, not everyone can be Coldplay or even a medium-sized band, so it's crucial that people can attend less popular, but equally exciting gigs. "Many of my favourite Newcastle gigs have been at places like the Cumberland Arms or the Head of Steam, both as audience member and performer. "Growing up I saw bands like Arab Strap and Mogwai in Middlesbrough Cornerhouse, which shaped my musical tastes as a teenager." Micky Sheehan, manager of the Victoria Inn in Derby, believes new and unknown bands would sell many more tickets to their gigs in small venues if they were more pro-active when promoting themselves. Image caption The network of venues is sometimes referred to as the "toilet circuit"
He said some had become "lazy" and instead of going out and meeting people and handing out flyers there was an over-reliance on social networking sites. "It's not a dying business - because I wouldn't be doing it if it was - but it's not all rose-tinted. "It is Facebook that has killed the need to go out and watch live music, and the need to talk to each other and get off with each other - because it can all be arranged and done on Facebook. "When bands have 800 likes on Facebook and they do the gig and there's only eight people that turn up to watch them I say to them: Do you know where those fans are right now? They're clicking 'like' on lots of other bands on Facebook." Is it right to deregulate live music?